At its basic level, Instagram is a social networking application made for sharing photos and videos directly from your phone. Unlike other social networks where you generally have the freedom to include whatever content you want, with Instagram, the main focus is visual. You share photos and videos, along with a suitable caption. Since it’s release in 2012, Instagram has grown to become one of the most popular platforms for online photo sharing and social networking. The social network currently has over 600 million active users, 400 million of which are active every single day. All those active users add up to quite a lot of shared photos and videos. And those shared photos can help generate even more likes and traffic to your site. Those active users also feature a core demographic of consumers, with most Instagram users between 18 and 29 years old. In addition to the standard photos and videos, Instagram recently added an Instagram Stories feature. Instagram Stories are similar to Snapchat in that you can share multiple photos and videos in a slideshow format to create your unique story. These Stories are only available for 24 hours, then they disappear forever. Instagram is primarily designed as a mobile app, and while you can view Instagram accounts and do things like edit your profile on desktop, you can only post content via mobile. 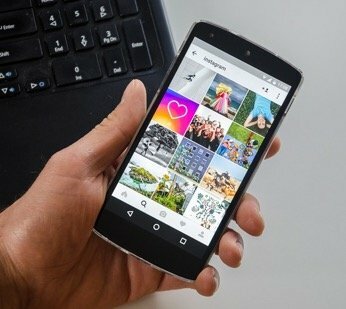 How Does Instagram Benefit Your Business? On Instagram, you’re unable to add clickable links to photo captions or comments. In fact, the only place you can add a clickable link is on your profile page. 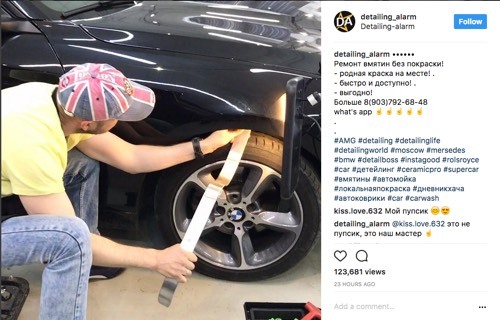 Other than using paid ads on Instagram, which also allow clickable links, many business owners are left wondering just how an active Instagram presence will be of any benefit to them. The fact that you can’t include clickable links actually makes it easier to build a sense of connection and relationship with your market on Instagram. It helps bypass the ad resistance many social media users feel and makes your presence there feels more honest and transparent. It’s why brands and businesses often find they can build larger and far more responsive followings on Instagram than on other social platforms. As I keep saying on this blog and elsewhere, as a business you now need to be where your market is not where you want them to be. Along with other content platforms, your market is highly likely to be on Instagram, and in large numbers. 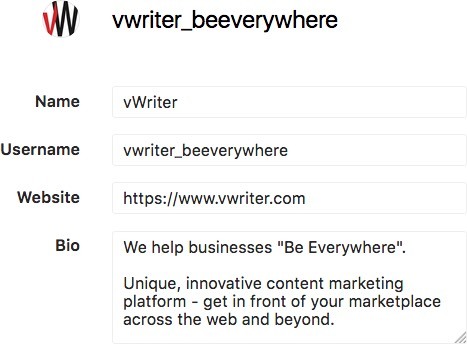 By connecting with your market on multiple platforms – a key tenet of vWriter‘s “Be Everywhere” philosophy – you again develop a much deeper level of connection with people in your market. This has a direct impact on your bottom line. Like other social media channels, Instagram can support and help your SEO, though relatively indirectly. A healthy following on Instagram, along with other social media platforms, indicates your level of authority and credibility. As outlined above, you are also developing a deeper sense of connection with your marketplace. Both factors can result in increased shares of your content and additional inbound links to your site, when followers connect with you outside of Instagram and have a deeper sense of relationship with your business. Both are of course vital to SEO. You may not be able to post links to an online site on Instagram, but that doesn’t stop you getting offline traffic through the door of your business. If you’re a local business, you can grow your customer base by posting appealing photographs that showcase your business in different ways. For example, if you’re a restaurateur, post pics of delectable dishes to water the tastebuds of potential diners in your local area. Restaurant feeling a bit empty? How about a promo where you invite followers to show the Instagram post for a 10% discount, valid for the next 24 hours? This is just one way in which a healthy Instagram following can rapidly build your bottom line. Huh? I thought you couldn’t post links? While that’s right, it doesn’t mean you can’t attract web traffic from Instagram. Firstly, you can of course add a clickable link to your profile. The more you post on Instagram, the more click-throughs you’ll likely attract over time. Secondly, include a call to action (CTA) within your posts using a simple URL followers can quickly enter into their phones. For example, you may have a give away or a promo on your site. There’s nothing stopping you sharing a post with a CTA like Go to [your website] and quick! Only valid for next 24 hours. Getting started on Instagram is incredibly straightforward, with just three main steps. Either download the app to your phone or go to Instagram on desktop. Sign up through Facebook, or enter in your basic information. Take care choosing your username. You want this to reflect your business as closely as possible. If your exact business name isn’t available, aim for a close variation. You can change the username later (depending on availability) but as you start building up followers and gaining recognition for your Instagram handle you’ll want to avoid changing it to something different. Upload a good profile pic. This should generally reflect your business logo to ensure brand recognition. Add the name of your business. Add a short bio with information about your business. if you’ve signed up through Facebook, you’ll find suggestions of accounts to follow based on your existing friends. Simply follow a few initial accounts that interest you to get started and get a feel for the platform. Preferably post at least once yourself – or perhaps a few times – so potential followers aren’t hit with a completely blank page. Cross-posting your Instagram profile to other social platforms you are on. For example, if you have a healthy Twitter following, let them know to follow you on Instagram too, preferably on a regular basis. Creative ways to use Instagram for best results are looked at more closely below. As with other social platforms, the more regularly and consistently you post content, the more your following on the platform will grow and the more successful you will be. Create attractive, high quality photos that fit with the brand image you want to present and that attract your target market. Washed out, fluorescent-lit photos just won’t cut it. Research and use relevant hashtags to help your content rise to the top and help followers find you. If you’re not sure what hashtags are or how to use them, checkout our Hashtag Marketing Mastery post. 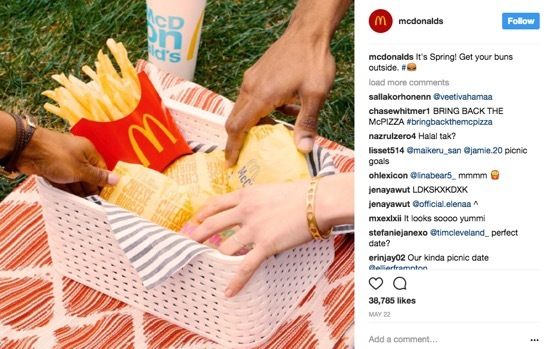 How Are Key Brands Using Instagram Effectively? Instagram has already proven popular with businesses worldwide – there are currently 8 million registered businesses registered with an Instagram profile. According to the International Business Times, Instagram is estimated to have brought in $1.53 billion in global mobile ad revenue in 2016. 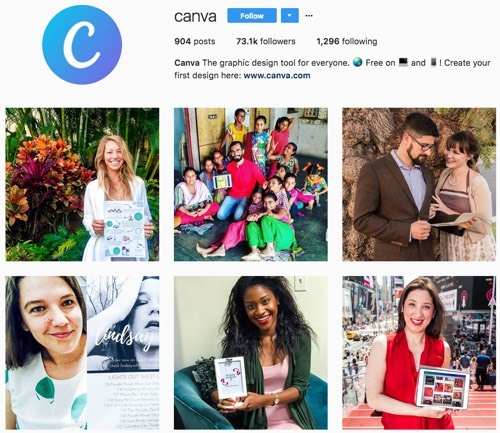 So how are key brands and businesses using Instagram? 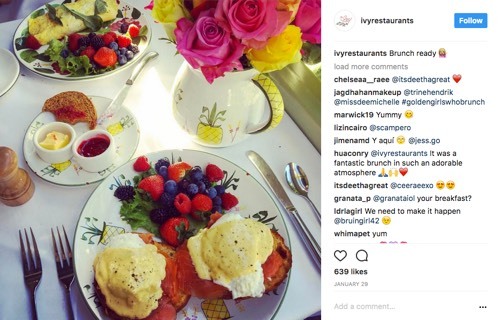 Here are a few ways in which various businesses are using Instagram to effectively generate revenue, increase engagement, and connect with their audience. 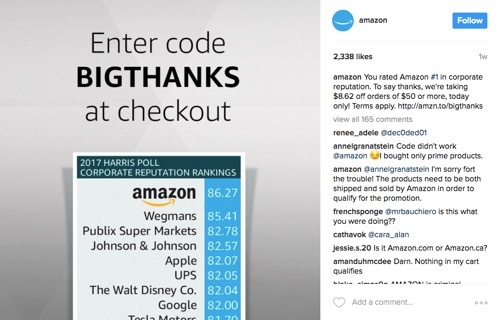 Amazon (@amazon) recently ran an Instagram marketing campaign that thanked their users for rating them #1 in corporate reputation. They posted an image of the rankings and in the comments gave their followers a discount code to enter at checkout to save money as a thank you. This helped build their connection with their followers, while also directly driving sales. Additionally, the company uses holidays, movie releases, season premiers of popular shows and similar to showcase related products. The photos are stylish, eye-catching, and always fun and the comments give a link to the product page where the product can be purchased. 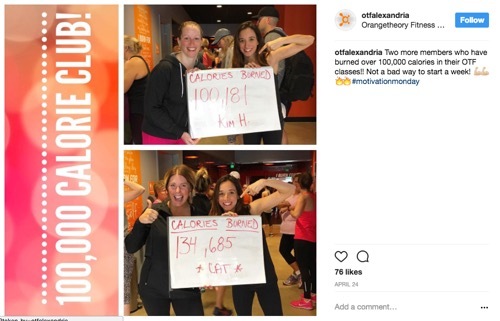 This popular fitness chain uses Instagram as one of their primary online marketing platforms. Orangetheory has separate accounts from its different locations (e.g. @orangetheoryla). It uses the platform to showcase upcoming fitness classes, often using the colourful equipment to catch the eye. However, their most effective use of the platform for marketing purposes comes from how they showcase their user testimonials. These photos inspire while building brand credibility at the same time. Disney (@disney) has long been a household name, but they are constantly looking for new ways to reach their audience. 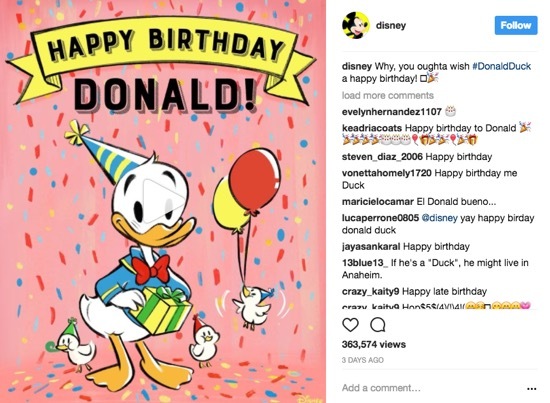 They use Instagram to get people excited about upcoming movies, share new and exciting things happening in their theme parks, or even just to say happy birthday to a beloved character. Again, these are all ways to build connection and a sense of relationship with their audience, while keeping the Disney brand in focus and front of mind for their target market. Nike (@nike) understands that Instagram is often a place of inspiration for many users. They play into this by posting images and videos that will inspire the aspiring and professional athletes who form their target market. This keeps their customers engaged with the brand, and also helps define Nike as the brand of inspiration. 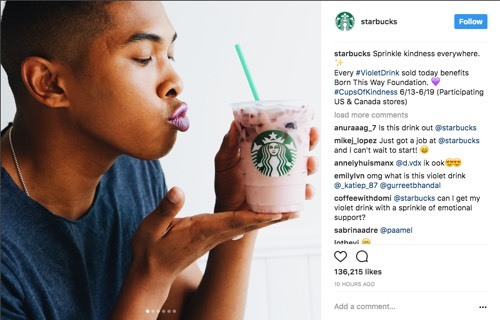 Starbucks (@starbucks) is an excellent example of how to keep Instagram posts closely aligned with a particular brand. They match whimsy with a clearly defined colour palette to show their cups of coffee (and other products) out in the world. There is a picture for most walks of life within their target market. In addition to showcasing their products, Starbucks strives to be viewed as a socially conscious company. They highlight this throughout their Instagram page, showing how they have helped their baristas graduate college, and how they are active in the progressive movement. Okay, not a key brand, but they are a fine example of how smaller businesses are also using Instagram to great effect. 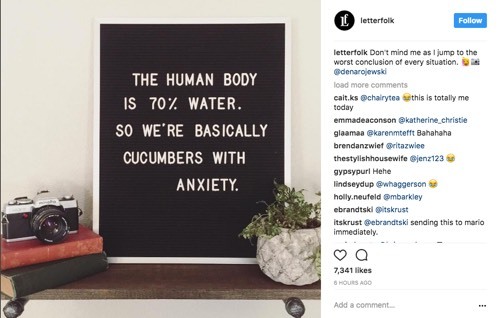 Letterfolk (@letterfolk) is a small business run by a husband and wife which creates customized letter boards. Their Instagram marketing offers something everyone can learn from. What they do really well is create posts that demonstrate the product, are relatable to to their target market, and are extremely taggable. On Instagram, one way users share content with each other is by tagging each other in the comments. This draws more users to the image, and increases the reach of your business. 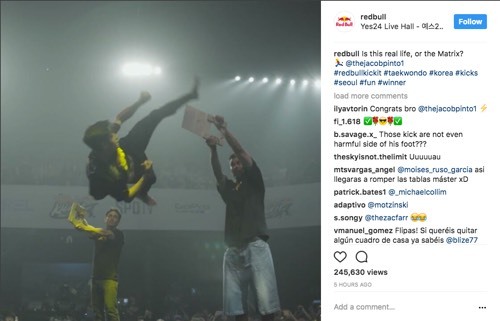 Red Bull (@redbull) very rarely directly showcases its own product on Instagram. However, each of their posts of extreme sports and action appeal directly to the market they aim to attract and connect with. Instagram reports that 50% of Instagram users follow at least one business. Unlike many other social platforms, businesses and brands mix with real users on the platform relatively seamlessly. It all means it’s an ideal platform for visually promoting your business and products – as long as you approach it in the right way. Photos on Instagram can also be shared instantly and cross-posted to your other social media sites. So what are some of the key, creative ways to use Instagram in the most effective way to attract your audience and spread your message? Consistency in how you present your business visually is important as part of any marketing strategy. On Instagram, as with Pinterest, it’s particularly vital, as it’s an almost entirely visual medium. So think about the visual identity you want to present on Instagram, and how that fits with your business’s image on your website and across other content platforms. This may involve crafting images for posts that stick to your brand’s colour scheme. By doing this well, those in your marketplace will quickly come to associate a certain palette with your company. Your visual identity may just involve the way in which your images are presented, and the type of image shared. So try to define a policy for your own business on Instagram that works for you, and can then guide and help you plan your content strategy for the platform. Businesses with a naturally strong visual element, such as restaurants or retail stores, lend themselves to Instagram particularly well. For example, like Amazon, you may choose to have a product-centric focus, where the majority of the pictures you post feature your product or products directly. Showing your products in visually rich, unique ways allows your followers to see what you sell and encourage their custom. However, there are plenty of other types of businesses who also do well on Instagram, using images (and video) in a myriad of different ways. Keep It Simple. Avoid cluttered backgrounds or anything too busy that takes the focus off the subject of your photo, or the main message you want to present. Create a Style Guide. Establish a few filters that work best for your business, and stick to them. Research and define the main hashtags to use for your Instagram account. Create and share notes about photo composition, updating them regularly as required. Colour Palette. Depending on your type of business, you may want to stick to a specific set of colours that work best with your brand in order to create a cohesive image and a recognisable look and feel. What if your business isn’t all that exciting or easy to photograph? Think about software, cybersecurity, accountancy or business consulting… strong visual imagery doesn’t immediately spring to mind. For these types of businesses, it can help to keep the Instagram focus on your company’s culture rather than your products or services. People like to see what’s behind the curtain and how your business runs on a day to day basis, and it can help your followers to connect with you in a completely different but powerful way. 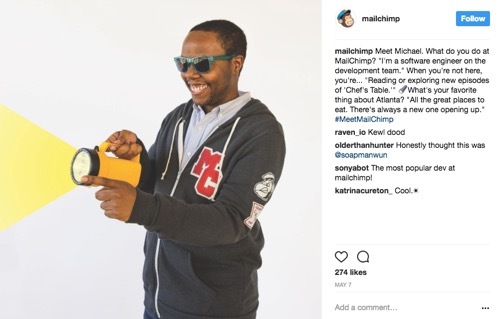 MailChimp does a great job of this, sharing their internal culture with the hashtag #MeetMailChimp. They use the hashtag to introduce a different member of the team each week. The photo shows off the person’s personality in some way, while the caption provides a short Q&A giving a bit more insight into the individual involved. The added advantage of this approach is that people love to connect with people. Your followers will love to share the joy of what goes on behind the scenes, and seeing the real people involved can really build their sense of relationship with your company. It can also help with recruitment. It can get the right people excited about the prospect of working for you and joining the same team, which can help with attracting and recruiting top talent. If your business has a following of loyal fans and customers, you can try posting content generated by them. Often these are images shared with you through tagging your account that are then re-posted, but these can also be photos you request. If you’ve just launched a new product, try putting out a call on social media asking customers to share the crazy places they’ve taken your product or the inventive ways they’ve used it so far. Then share these photos on your feed to inspire your followers in new ways. Provides social proof of your product and builds authority and credibility. The caption you post with the photo conveys your business’s message as well as allows you to make use of hashtags that allow your content to be more easily discovered. There’s no limit to the number of characters in the caption field, and you’ll often see photos shared with a virtual wall of hashtags. Take advantage of this flexibility and create a custom hashtag for your business, a specific event, or an ad campaign you’re running. Use this hashtag whenever you share your content and encourage your followers to do the same. Instagram users can click on the hashtag to discover all the photos shared with the same hashtag. This also allows new users to find your content organically and helps you attract more followers. Instagram is a rapidly growing social media platform with high user engagement. By using it in the right way, you can not only spread the word about how your business adds value to people’s lives, but you can connect with the customers in your marketplace in deeper, more meaningful ways. As we’ve seen, for all the benefits it can bring, Instagram is not a platform your business can afford to ignore. Don’t worry about having a perfect Instagram presence from the off. Just start experimenting with the platform as a new way to connect with your marketplace, attract new followers and build your online visibility and authority… and adjust your strategy as you go along.